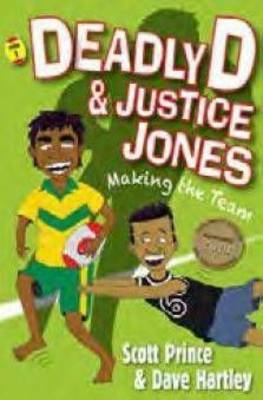 Thanks for talking to Boomerang Books, Deadly D/Dylan and Justice about your Deadly D and Justice Jones books (Magabala Books). Kids who like rugby league and sport are going to love these books. What are your favourite football teams and players? Dylan: Growing up in Mount Isa and being a North Queensland boy, Cowboys are my favourite team with Broncos a close second. Justice: I loved the Warriors before I met Dylan. Now I love the Broncos too because Deadly D plays for them! Dylan: Well brah, I grew up in Mount Isa and loved watching and playing rugby league and spending time with my cousins. I’ve got a hidden talent – when I get angry I turn into Deadly D, but apparently it’s a secret so don’t tell anyone. Justice: I was born in Wellington, New Zealand and now I live in Brisbane. I sit next to Dylan in Mr Barwick’s class. The chicks dig my hair cuz. I spend too much money on hair product though. Nah, just jokes man! Who are your friends and enemies at school? Dylan: My main man is Justice Jones, he’s got my back. We’re like brothers from a different mother. We’re not overly friendly with Jared Knutz and his crew. They try their best to get under our skin. Is Deadly D really better looking than Scott Prince? Justice: Princey always looks sharp on the telly with his fresh haircuts, but Deadly D has the big muscles and looks that could stop the traffic in downtown Brisbane bro! All his followers on Twitter compare him to Brad Pitt. Is Sam Thaiday really afraid of heights? Dylan: Yes he is, ever since the day he slept in his tree house as a kid and sleepwalked out the door he’s been afraid of heights and falling. Not many people know about that, but he has a scar on his forehead to prove it. Look closely and you’ll see it. How do we find out more about you – is another book on the way? 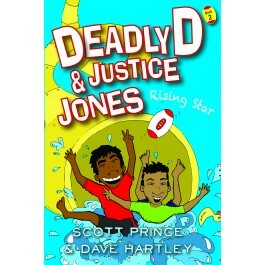 Justice: Our latest book is Deadly D and Justice Jones – Rising Star, but I think those funny fellas Scott and Dave are working on the third book. I hope they are because I’m getting heaps of fan mail. How do you work out who is writing what? Dave: Scott and I talk about the events that will happen in the story and we map it out. I’ll write the skeleton of a few chapters and then meet with Scott to flesh them out a bit more. How do you make the stories funny? Scott: Well if you spend half a day with Dave and I, you’d understand our humour and we both look at the bright side of life. How do you keep the writing so tight? Dave: We always have a lot to fit into our stories and we like to keep the momentum strong, so our writing is always action-packed. We like to keep the reader guessing. Who is better at drawing – Scott or Dave? Scott: In terms of drawing and expressing our ideas that we come up with, Dave is talented enough to portray our vision on to paper. But he still hasn’t given me a chance to express my drawing capabilities. I don’t know where he hides the pencils. Why have you written these books? Scott: We’re passionate about getting reluctant readers to pick up a book. We understand from our own experiences growing up as sport lovers that rugby league is a very powerful tool to engage children to read. It’s also an opportunity for me to express some life experiences by keeping it real but by also using our imagination, as you’ll see in Rising Star. What feedback are kids giving you? Scott: Through the editing process, we’ve found that our own kids have been very honest in their opinions! We’ve had to wipe some tears of laughter and disappointment, but they’ve played a key role in shaping stories. Dave: Some of our readers tell us that they’ve read our books ten times in a row, which is amazing. They also give us ideas about what to write for each character in upcoming stories. So if you’re reading this, please find Deadly D Books on Facebook and share your feedback with us – we’d love to hear it! Thanks very much, Deadly D, Justice (Scott Prince and Dave Hartley).